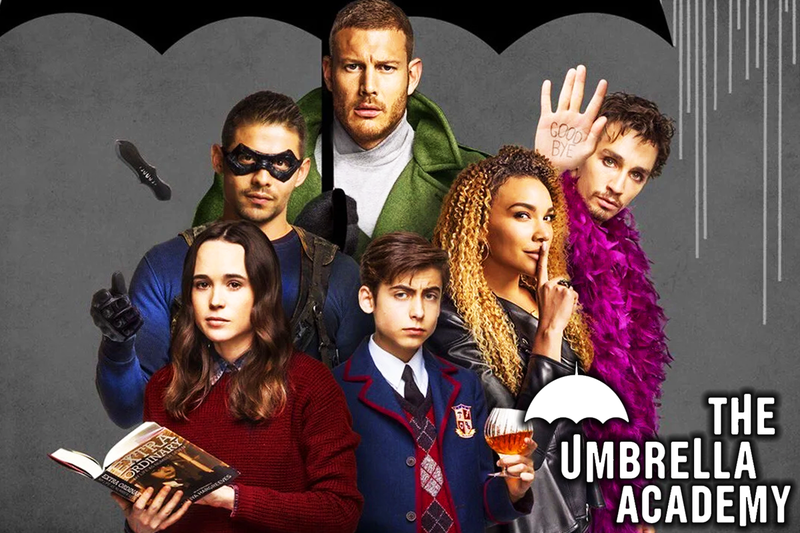 The Umbrella Academy is the latest superhero adaption to hit Netflix, despite the streaming platform recently cancelling popular Marvel shows like Jessica Jones and Luke Cage. It features a group of gifted children who were taken in by an eccentric billionaire, who aims to train them to stop the end of the world. In an alternate reality where JFK survived, nothing makes sense and the audience are faced with more questions than answers as the story unfolds. The show kicks off with the death of the children’s mentor, Sir Reginald Hargreeves (Colm Feore). He’s as callous as they come, evidenced by the way he named the kids in the numerical order in which he bought them. Number One/Luther Hargreaves (Tom Hopper) is almost impossibly large with extreme strength, and takes on a role as a leader of the group. Number Two/Diego (David Castañeda) has the ability to always hit his intended target. is Allison/Number Three (Emmy Raver-Lampman) has the power to warp minds through suggestion, Klaus/Four (Robert Sheehan) is an addict who can converse with the dead, while Five (Aidan Gallagher) can travel through space and time. Justin H Min plays the deceased Ben/Number Six, with a Kraken-esque power, while last, (and least) Ellen Page plays Vanya, with no discernable talents aside from playing the violin. Phew. We still haven’t been through half of the main characters, and the full ensemble splits the action between a range of perspectives during each episode. Casting is a particularly strong point, as each of the students has a distinct feel and personality. The same goes for actors in supporting roles, which include contract killers, a Stepford android, and a talking chimp. It’s not as outrageous as it sounds, and it tries to ground itself in reality wherever possible. 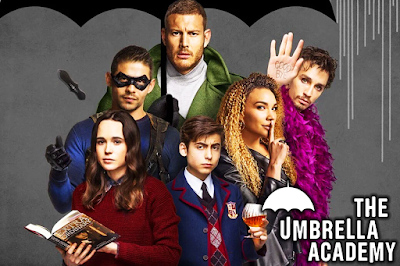 As a deconstruction of similar shows like X-Men, The Umbrella Academy shows the potential for things to go wrong within such a dysfunctional setup. Children are always going to struggle in an unhappy environment, and powers come with complications you’d expect. People don’t take well to having their minds warped, while The Sixth Sense already showed that “seeing dead people” probably isn’t ideal for kids. The hierarchy of the group isn’t always firmly established, and it’s fun to see them bickering after spending the last few years apart since Ben’s death. The premise is well worth an expensive first season, and a lot of the show takes place in the sprawling academy, which drips with detail. From the bedrooms to the art on the walls, it looks lived in, with similar attention paid to other settings throughout. Of course, it’s not perfect, and some parts do drag over the 10 episodes. Some plot threads are slower than others, and the lack of mobile phones or the internet, (possibly due to the changed timeline) lead to problems that would probably be solved with a quick call in our universe. It’s worth persevering with slower scenes to appreciate the story coming together at the end, with a strong finale and a strong sequel hook.